When we think about Sumatra and Java; Volcanos, Earthquakes, and Tsunamis tend to come to mind. Indonesia has over 2,000 natural disasters every year (mainly due to its position on the highly unstable Pacific Ring of Fire), from tsunamis and volcanoes to fires and earthquakes. With the natural disasters that have happened over the last six months in Indonesia, there has been no doubt as to the power of the famous ring of fire, and consequently, the challenges that ensue as a result. 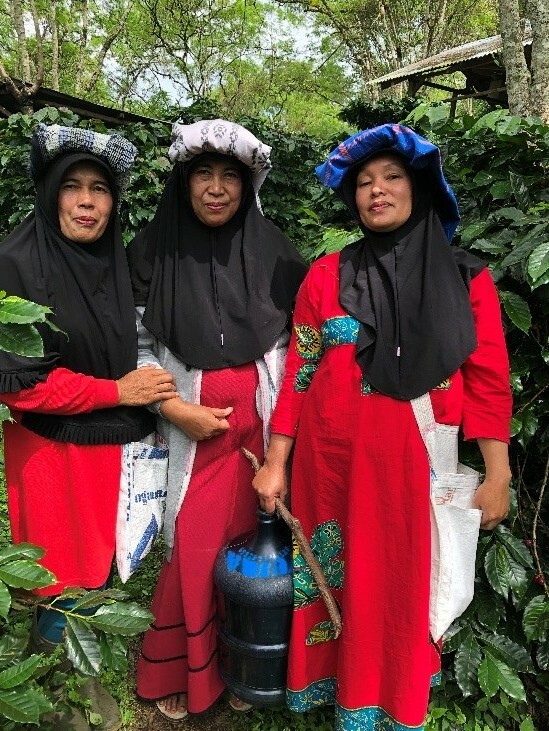 Coffee is one of the best ways to earn a decent income in the agricultural sector and is grown in nearly all the islands across the Indonesian archipelago. Sumatra Island dominates production with 74.2% of Indonesian coffee grown here; with the largest Robusta production in Bengkulu, Lampung and South Sumatra areas. All the rest of Arabica and Robusta is distributed in Sulawesi (9.0%), Java (8.3%), Nusa Tenggara (5.8%), Kalimantan (2.0%), and Maluku and Papua (0.6%). After Indonesia reached independence on the 17th August 1945, farmers gained more control in coffee cultivation as the government reduced its role in the coffee plantation. Today, in Indonesia around 96% of the coffee growing areas are smallholder farm cultivated in monoculture and not intensively managed. Coffee yield is still relatively low i.e. 500 – 800 kg/hectare/year which is around 60% of potential production. This is due to the use of underproductive coffee varieties and some of the coffee trees being already too old. The risk of another natural disaster considered, I decided to head off in December to Sumatra to visit our main partners in North Sumatera, Aceh Gayo and Java. Even though coffee communities are facing difficulties with the recent disasters, we saw nothing but smiles and positivity from everyone met. After a hard year in 2017, where the crop loss was 40% of total volume, it was time to see and get a view on new crop 2018/19 and understand how the groups confronted these different challenges. I also took the opportunity to visit East Java as I am determined to build new relationships with different smallholders from Kayumas and also from other islands in Indonesia such as Las Flores, Bali, Papua and Toraja. During this trip, I travelled with Diana on her first origin trip, along with our Irish customer Java Republic David and his daughter. It was a special group since we shared so much during our journey and we focused on the strength of our relationships. We started our trip on Sumatra Island. This season the quality looks really healthy with a good yield. The harvest starts in October and finishes in May, and the coffee is collected in two main crops. From October to December and then from February to May. Since weather conditions are changing, these two crops are similar in volume and more likely the fly crop will become the main crop. In Sumatra, the main Arabica production is in Aceh Gayo and North Sumatera, this is why we focused our visit on these two regions. 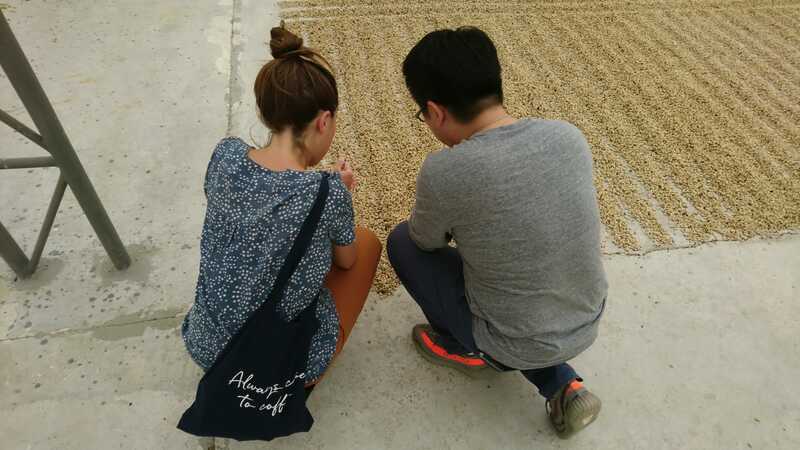 There is a strong culture of coffee but the internal market is complex with many parties in the supply chain, including Collectors who are internal middlemen, and large price volatility. 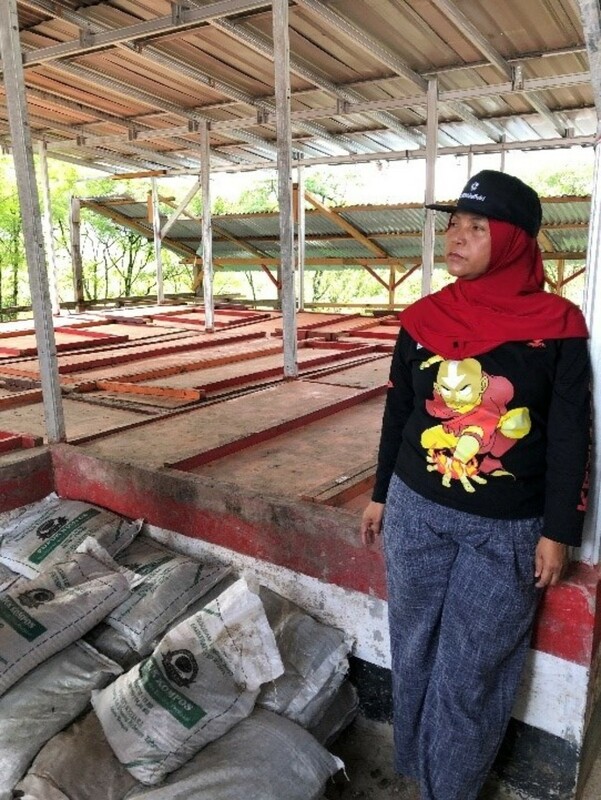 In Aceh, Producers have been playing a more active role in collaboration with the collectors, to ensure quality control is maintained throughout this supply chain. We started our journey in Lae Mungkur village, Sidikalang sub district, Dairi district, North Sumatra close to Lake Toba. Here we work with “Wahana Estate” meaning “Vessels for Great Success”. 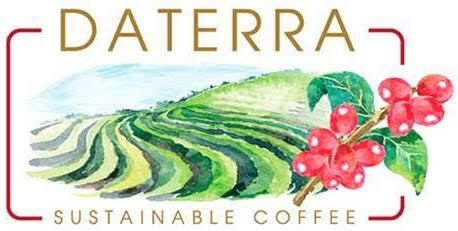 It the first single and specialty estate located in Sumatra and was established in 2005. The estate is between 1,200-1,500 metres above sea level and has 468 ha of farm land, of which 250 ha is covered by coffee. 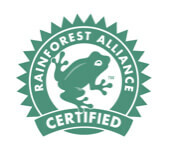 It is Rainforest Alliance certified and they employ almost 1,000 people. Workers are paid minimum wage (around 7USD per day) and are provided with free housing, electricity, drinking water, healthcare (including free medicine), and a nursery for children. The estate has also built a church and small mosque inside the farm’s grounds. Since our last visit they have changed a few things, including more of a focus on varietals from other origins, more development and training and more attention paid to varietals that give a good cup and are productive. They have 13 different local and international varietals. These are carefully separated into different lots in order to produce distinct single varietal coffees, including some interesting local Indonesian hybrids; Rasuna, Long Berry, Andong Sari, Toraja, S795 (Jember), Jantung. And more widely known international varietals; Caturra, Catuai, Villa Sachi and Colombia, Típica varieties. Each hectare can support around 2,000 trees – these are evenly spaced at 2m x 2.5m and are shade grown under local Lamtoro trees. 45ha is planted with Long berry which represents 25% of the estate and 45% of the farm is Rasuna Varietal. All plots are divided in 1.50 ha . Andry is the main agronomist and Henry is the manager of the farm. In some plots they have adapted their pruning technique for the Toraja varietal. They are using the following method: Cutting down half the tree to let the sunlight enter into the soil thus making sure the soil does not get too moist thus avoiding diseases such as roya, this process also allows more sunlight to get to the leaves which increases photosynthesis. They have now built their own wet mill so they can process their own production and cherries from neighbouring farms. This way they can control the entire process and get the best of the coffee – from sorting floaters, pulping only the ripest cherries (by adjusting water pressure at their eco mill), and sorting parchment beans by water density. They are mainly processing fully washed, wet hulled and some natural process initially requested by their Japanese customers. Their natural process is quite spectacular, first they dry the ripest cherries for a day on their patio which is covered under a canopy (to protect it from the rain), then the beans are dried in the mechanical dryers for eight days at 40 degrees which makes a noise that is reminiscent of waves crashing on the beach. The dried berry looks like a Malteser and the coffee tastes like a creamy strawberry Maoam. After our stay at Wahana estate, we drove through Sidakalang district and reached Lake Toba. 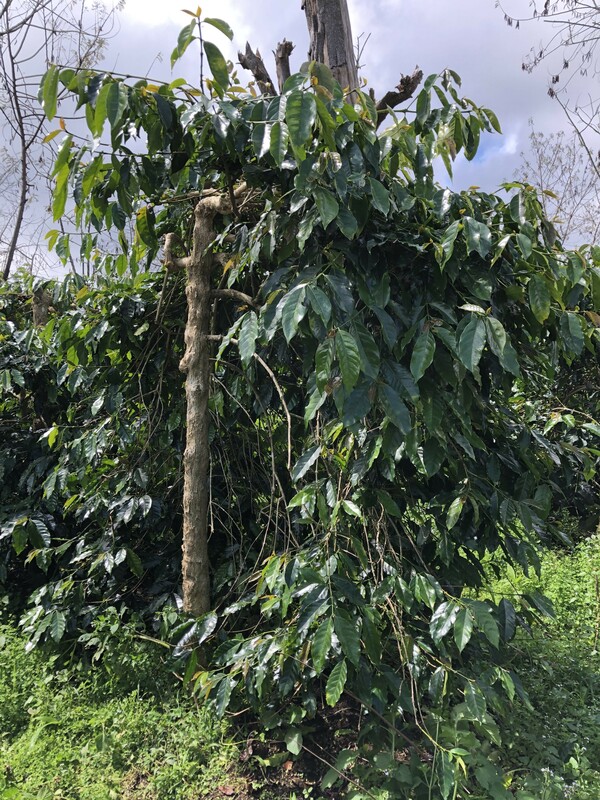 We visited some smallholder farms where they produce coffee as a cash crop because they have a diversity of agricultural products ranging from cabbage to peppers. In this region and Indonesia as whole, the coffee is mainly bought by collectors (internal middlemen). A collector is the person who receives the parchment (occasionally coffee cherries). He pays the farmer on each delivery and then sells it to the cooperative or directly to the processor/exporter. Nowadays, more collectors have a community wet mill which allows better quality control at the point where the cherries are delivered and then onto exporters. In this region, Organic and Fairtrade certified coffee is rare. The main production for Organic Coffee is in Aceh where we continued our journey. 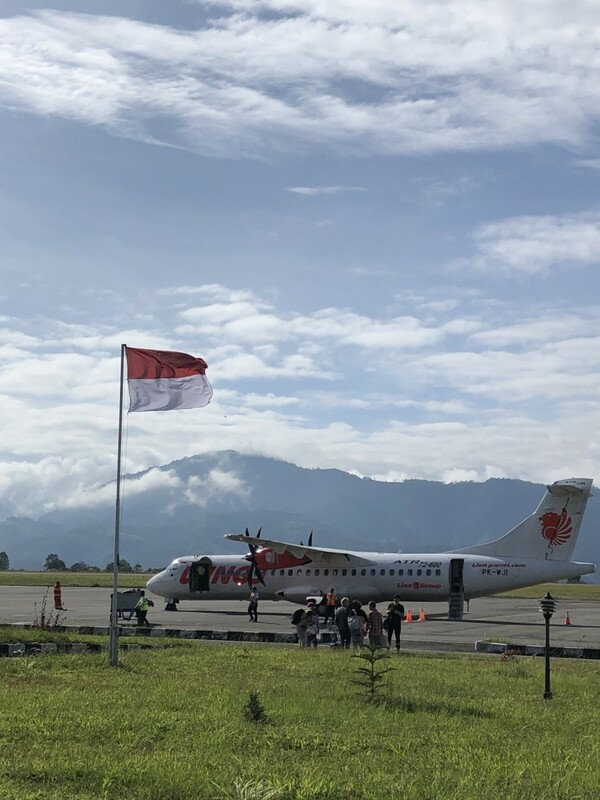 We took a flight with Wings Air owned by Lion air to get to Takengon in Aceh Region, the main coffee area where 60% of Arabica coffee is produced. 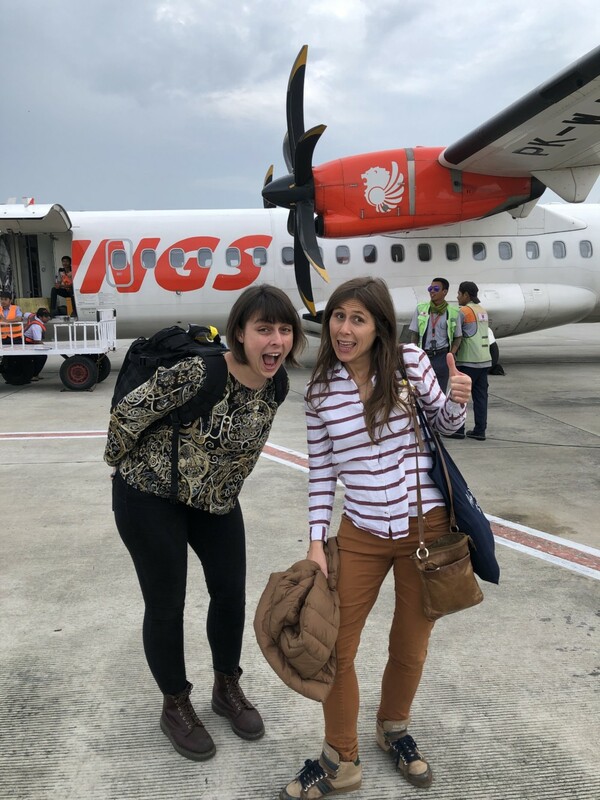 Even though there is always a risk taking this flight due to the lack of security regulation and the weather conditions, we decided to go for it! We landed safely to Takengon, where our friends from Sari Makmur were waiting for us. We visited one their partners Coop’s, Muratia, that was founded in 2018. 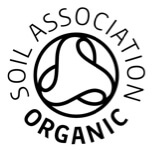 They are Organic and Fairtrade certified and already have 800 members in Bener Mariah. We could see that all the farmers were managing their farms with care and attention because it is their main cash crop. Coffee coming from this region is known as Mandheling even though originally the name comes from a city located in Middle East Sumatra, Mandheling Nata. It is where the first Arabica grew on the island under the Dutch colony. It became famous when the Japanese promoted it back to Japan after their occupation of Indonesia in World War 2. In this region 99% of people are Muslim and there is a strict Islamic culture driven by Sharia law. Our travel, visit and meetings were arranged accordingly as they pray five times a day and on Friday all business are closed in the afternoon for praying and dedication time from 12pm to 3pm. 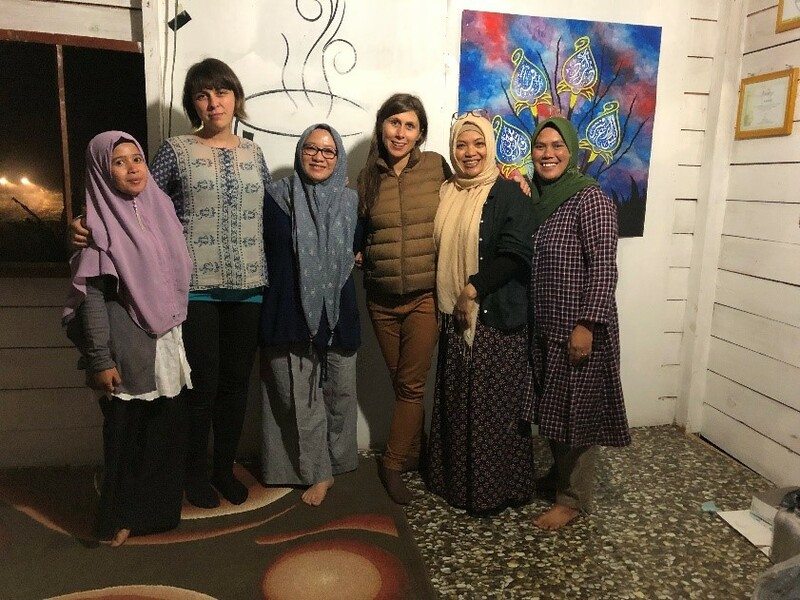 While I stay in Takengon, I noticed that family and religion are two of the most important commitment s for the people I met. Discussing Sharia Law with women, we were told that the restrictive rule can protect and create a fairer system for them . For instance, there is a ban on the use of drugs and alcohol in coffee communities which can be an issue in other countries. They also said families are treated very well with education and prayer. Being aware of the culture, we did adapt to all our partners respecting their time engagement and priority. The majority of the farmers in this area are part of cooperatives growing Fairtrade coffee and are also Organic certified. In this region 26 cooperatives are Fairtrade certified out of 28 in total in Indonesia – Fairtrade and organic farmers receive premiums at the time of delivery to the collector and use the Fairtrade premium within the community where 25% of it needs to be used for coffee quality concerns. 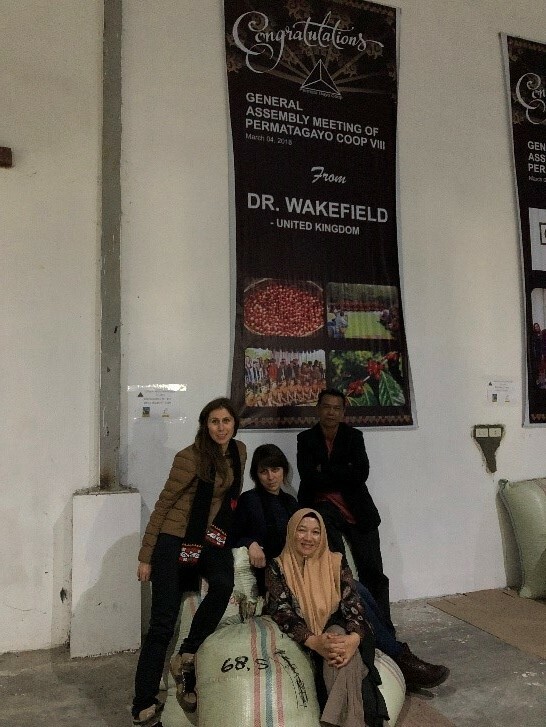 Then, we continue our visit to Cooperative Arinagata, which is one of the Gayo arabica coffee producers and was one of the first three certified cooperatives to be founded in 2006. Today, the cooperative has 2,168 members under 2,436 hectares of coffee plantation covering 32 villages in Aceh Tengah. Since our last visit in 2016, we have seen impressive changes. They have put a lot of investment in their quality control and today they have their own lab which was financed by their Fairtrade premium. They have one full time quality manager, who already has experience from other companies. They grade and cup every single lot delivered from their own collector which is the equivalent to a traceability level of a village. They still process all the coffee in Takengon in their own dry Mill and then export it from Medan. They have built their own Wet/Dry Mill after a two year project. It is the only cooperative in Aceh which can control the quality of the cherries. They have a washing station with seven pulpers that can each process 2.5 MT of cherry. They are able to get the coffee processed from Double soaked, Fully Washed (traditional dry hulled), Gilling Basah (traditional wet hulled) to semi washed honeys and naturals. 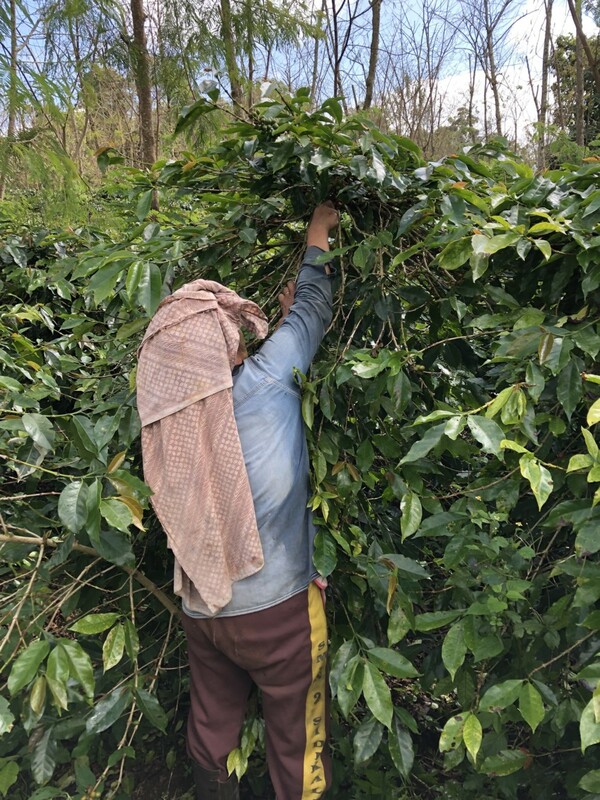 They also built a canopy with the Fairtrade Premium to better dry the coffee and therefore reduce the risk of mould and fungus when drying coffee during the rainy season. Armia’s ultimate goal is to have the coffee ready for export in Takengon, this is why they also have invested in a dry mill and more storage capacity. Their sister cooperative Kokowagayo was founded in 2016 and is growing and benefiting many of the women who wish to have their own voice and work along with their husbands as equal investors. 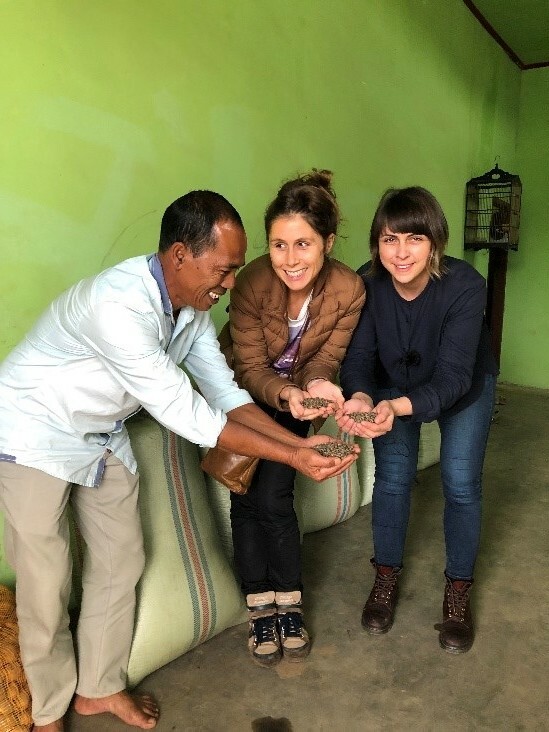 This cooperative joined the Café Femenino program for which we are an agent in Europe, and within the program coffee is already sourced from Peru, Bolivia and Mexico. In this cooperative 18 women are in leadership roles and 544 women are members producing 36 containers per annum. 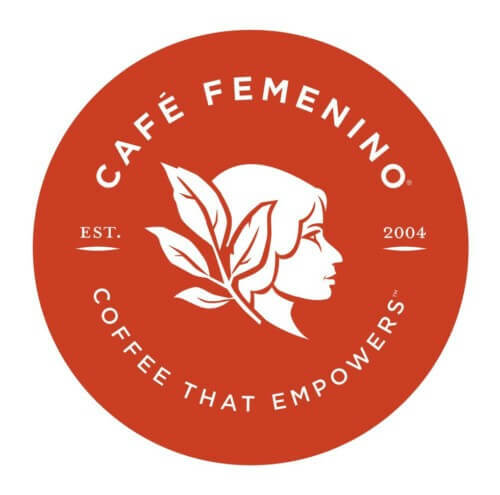 Since starting the Café Femenino program, the women have used their premium to offer leadership and financial training to female coffee farmers, set aside capital for women’s entrepreneurial efforts, and built a community centre above their wet mill to provide a safe space for women to congregate to learn new skills. One of the highlights of the trip, was our first visit to Ketiara Cooperative who we have worked with for the last two years. It is also a cooperative mostly run by women but independent of the Café Femenino Programme. They have 75% of female members in 20 villages. 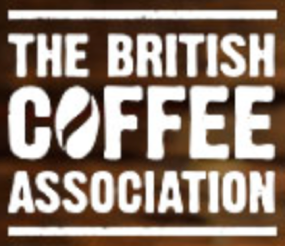 They pay their members a social and quality premium, all their coffee is certified organic and Fairtrade. 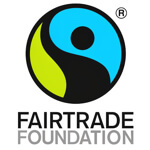 The Fairtrade Social premium is distributed every year for different needs as requested by their members: Cutting grass machines, rice distribution at the end of the non-harvest period (called flat months ), free coffee seedling s, free distribution of orange or avocado seedlings to encourage diversification. The leader Rahma is an incredible woman, she founded this cooperative and export company by herself. Originally a farmer, she created a network of contacts and experience to benefit the farmers from her village . The quality of their coffee is brilliant and the internal supply chain of the cooperative is well defined from farmer to delegate (another middleman) to collector to cooperative. They also assist farmers by training them on the use of compost. They start by collecting the organic waste in every village, then providing the compost to each farmer, they then train the farmer to be able to do it themselves. They also train them in cupping, and keep the farmers fit with an Aerobic sessions that are held every Sunday morning at 7am – we also took part one morning and had a wonderful time! As most of you might know, Sumatra has a particular way of processing the coffee called Galling Basah. Farmers deliver the “Gabah” which is wet parchment coffee with around a 45% moisture content. The Gabah is then dried immediately (on large, clean and impressive covered patios) for around a day prior to hulling. After hulling the “Labu” wet green bean at 30% moisture takes a further two days to become “Assalan” which has a 20% moisture content. Then the Assalan is transported to the main Dry mill where it will be further dried for half a day to 13% as unsorted green bean which is then ready for grading and export . 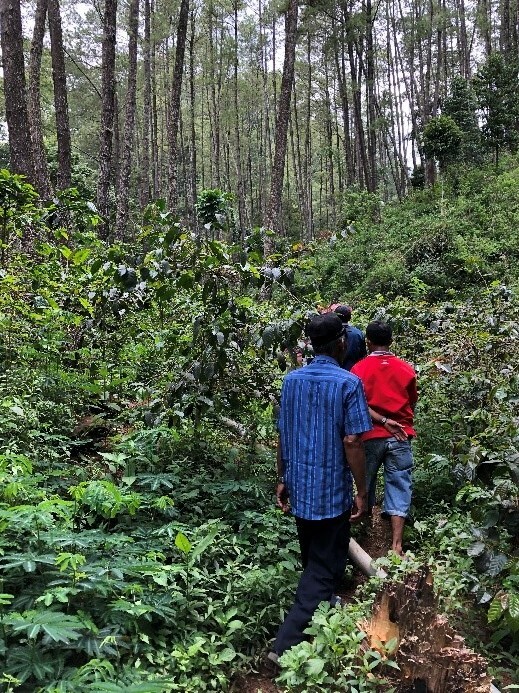 Last year Sumatra faced issues due to the weather conditions which meant a lower crop, and with Starbucks buying 60% of the volume, the other 40% is more fiercely contested. Therefore, the internal market is really speculative and hard to predict, as farmers are not 100% committed to the cooperative but will deliver to the collector (bank) who will pay more. But we do feel the effort from the farmers to get better quality and keep up good productivity. Some of our partners are revising and thinking about changing their processes. On the positive side, they want to collect and control the cherries to guarantee a better quality. But new processes such as fully washed and natural might give great coffee but may lose some of the characteristic of Sumatra. After a very enjoyable time in Sumatra, we were sad to leave but excited for our next stop, Java. We had to fly from Medan to Jakarta to Surabaya and then another seven hours of drive time to reach our final destination: Kayumas located in East Java. Before getting into the depth of our new partner group, let‘s have an overview on Java and its coffee history. Java is the world’s most populated island with 141 million inhabitants on a landmass of 138,793 km² and it is home to 56% of Indonesia’s population. Java is so steeped in coffee history that the name itself is synonymous with this precious commodity and the island is home to some of the oldest plantations in the world. The Dutch, who colonized Indonesia from 1602 to 1945, got their first taste of coffee when in 1614 some Dutch traders visited Aden in Yemen. They examined the possibilities of coffee trading but it was not until 1640 that the coffee-drinking habit developed in the Netherlands. The first coffee plants arrived in Java in 1696 from Malabar, India. The plants were originally grown from the seeds of arabica coffee and brought to Malabar from Arabia. A few years on, production increased, and coffee was brought to Central and South America. Formed mostly as the result of volcanic eruptions, Java is the 13th largest island in the world and the fifth largest in Indonesia by landmass. A chain of volcanic mountains form an East–West spine along the island. Java is divided into four provinces: West Java, Central Java, East Java, Banten and two special regions, Jakarta and Yogyakarta. In Java, it is worth mentioning that 20% of the production is held by a government company PTPerkebunan Negara XII (PTP). The company runs six estates in East Java representing 85% of the coffee in East Java with a combined size of 5,600 hectares. Four of these estates are tucked into the hills of the Mount Ljen volcano, with elevations ranging from 900 to 1,600 meters above sea level : Jampit, Pancoer, Kayumas and Blawan. All producers, workers and get a minimum wage, other smallholders are grouped under cooperatives. 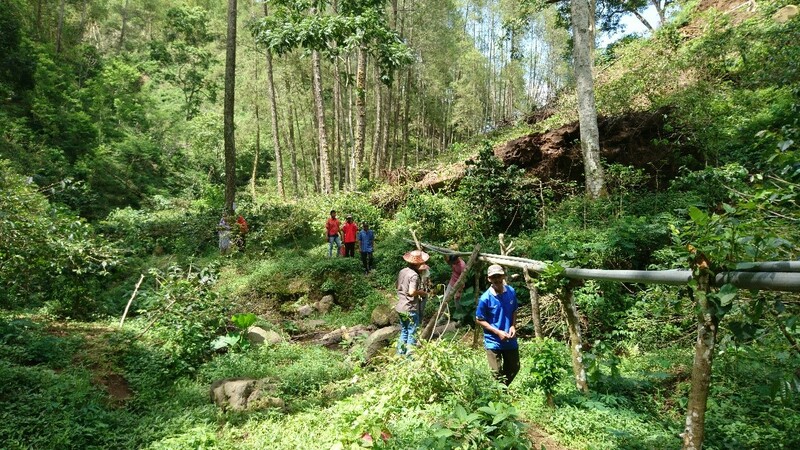 Let’s turn back to our trip in Java where we visited a renewed cooperative formed in 2011. Surya Abadi Kayumas cooperative is located between Kayumas and Taman Dadar villages. 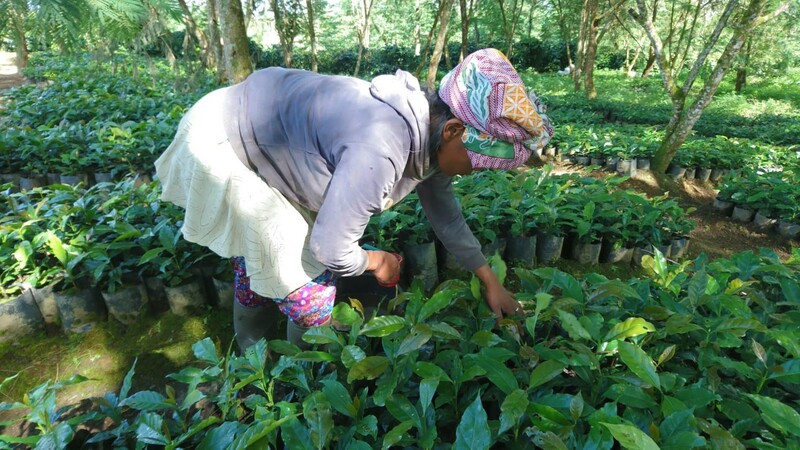 This cooperative has been helped and supported by Indokom (a private exporter) through assistance with a program from Indonesa Coffee and Cocoa Research Institute( ICCR I) and also helped them with Fairtrade and Organic certification. Smallholder Arabica farmers in Kayumas and Taman Dadar villages apply organic manure which they produce themselves inside the farm (from cattle, goat and poultry). Most coffee farms are a monoculture however the farmers use permanent shade trees such as Erythrina, Albizia and Leucaena. Shading intensity in traditional farming ranges from 30% to 50%. From the shade trees the farmers can collect feed such as avocados and fruits for their animal husbandry. They grow mainly S 795 variety as recommended by the Government. The variety belongs to Typica group, which is also widely grown by the farmers to produce Toraja coffee in South Sulawesi and Java Estate coffee in East Java. The other variety grown by the farmers on a smaller scale is a USDA 762. We were travelling after harvest time, the peak of the season is between May to September. During harvest all farmers selectively hand-pick red cherries throughout the day. They all help each other as they are part of the same producer group; they then deliver the cherries to the central processing unit called the wet mill. 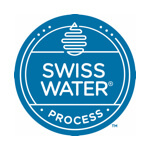 The cherries are processed as wet or dried hulled under the guidance of the processing manager. 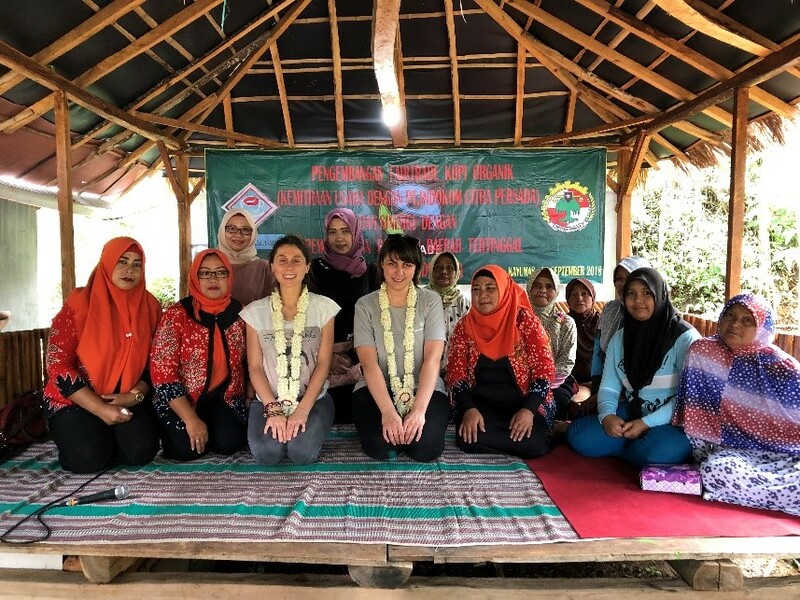 The cooperative is managed by a women, Mrs Siti, and they are a well-organized group offering training in pest management, improving coffee quality and productivity. Intensive communications around technical issues and marketing between farmer groups and ICCRI are conducted during the harvesting period. 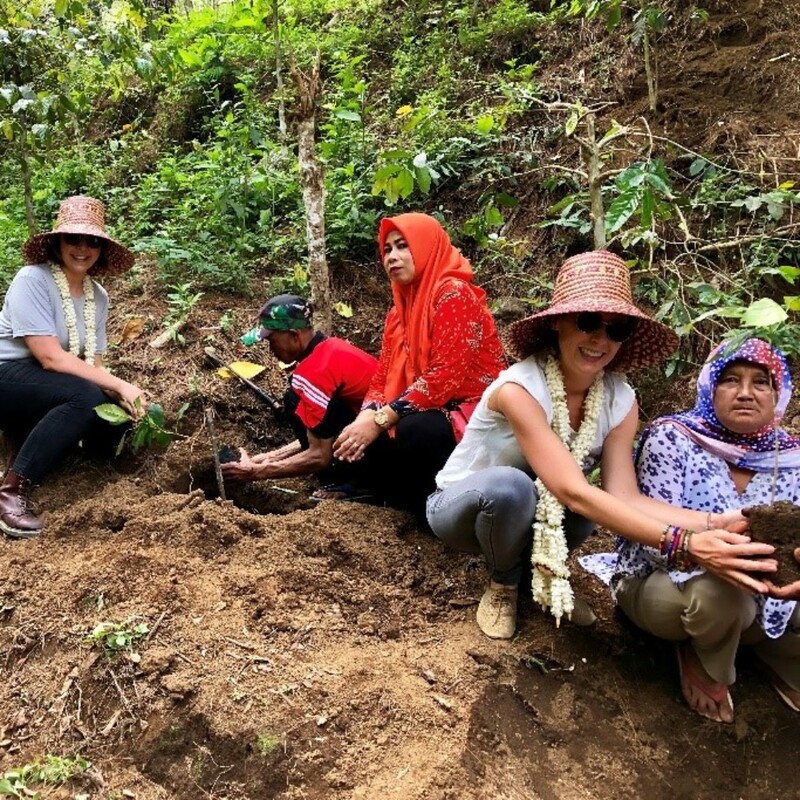 The group is doing well and this has not gone unnoticed; for instance a farmer moved back from Bali to his village in Kayumas because he believes in the next generation of coffee and today he manages a 4ha plantation of specialty coffee. Farmers rent the land from the government as all lands are under leasehold, they either pay rent or deliver part of their production to the government. After spending all day with the group we drove back to Surabaya and visited Indokom PT dry Mill and office. Indokom is an exporter which was founded in 1995 and engaged in coordinating best practice among the coffee farmer groups through the ICCRI, to support them in producing commercial, premium and specialty coffee. They are engaged mainly in Java but also in Las Flores, Sumatra, Bali and other Indonesia islands. Mr Saimi who is the owner and founder of Indokom is convinced that the future is to encourage autonomy and entrepreneurship spirit to all farmers. 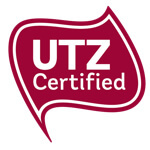 At DRWakefield, we are pleased to work with this new partner as they align with our quality and sustainability values. 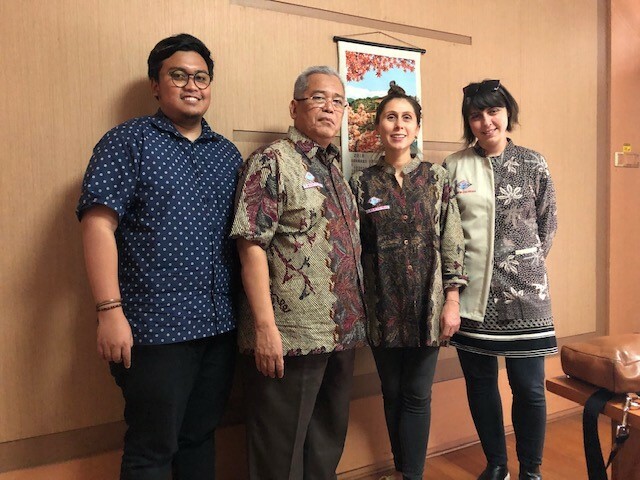 Before returning to the UK, we had a meeting with one of our long term partners, Lintas Utama, they are a family company specialising in processing Java coffee from smallholders and exporting from PTP estate. Since the growth of the domestic market in Indonesia, they sell Robusta internally which represents 50% of their business, the other half is exported to Europe, USA and Australia. 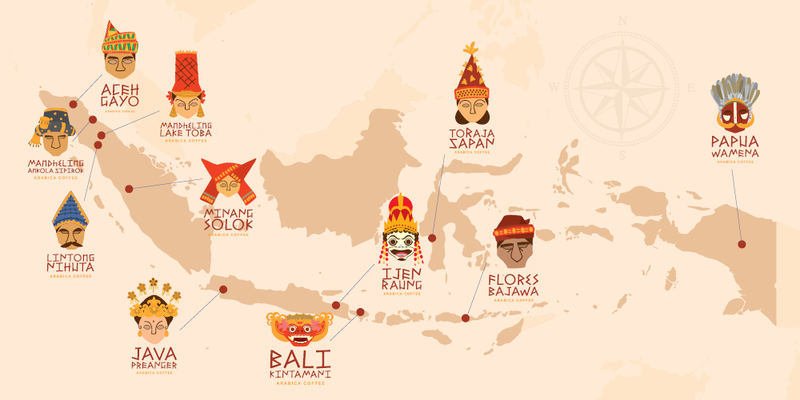 Indonesia is full of diversity with its people, culture and natural beauty. Despite the natural disasters the country faces, there is a booming internal market that is consuming more and more coffee. 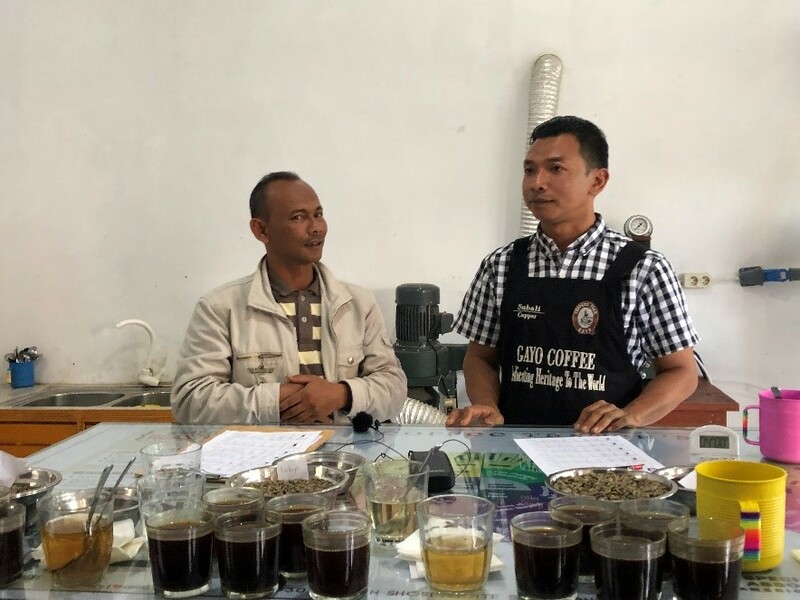 There is more interest in specialty coffees and traceability – whether it is from Sumatra Aceh Gayo or East Java Kayumas, Las Flores or again Bali. Indonesia is not just an exotic earthy high acidity coffee but it can reveal a huge potential range of flavours. This is down to the work of Indonesian companies exposing and developing these unique terroirs. We are pleased to participate in this drive and help you to discover some of the best these special lands produce in 2019. 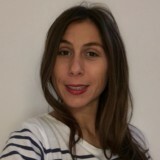 Priscilla is a Senior Trader at DRWakefield, she is a native French speaker and fluent in Spanish and English.